There is one cheap and not bad dash camera from Bestbuy Canada. The on sale price could be $49.99 or $59.99. 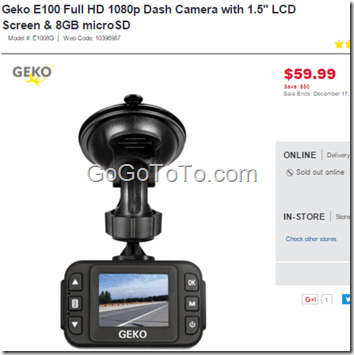 Geko dashcam is price cheap, but it provides necessary functions which most drivers wanted: not that bad video, loop, auto start and end, G-sensor, and motion detect. If its video quality can be improved a little bit, that will be better. Of course, if your budget and be around $100 dollars, you can consider other dashcam since Geko can not give you a clear quality video especially at night time. Gmail Voice and Video chat is available !